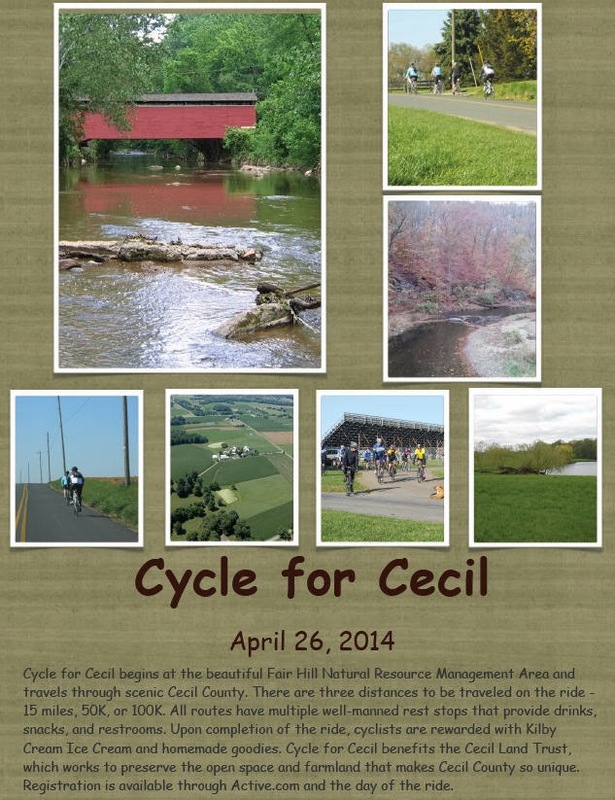 Cycle for Cecil begins at 8:00 a.m.at the beautiful Fair Hill Natural Resource Management Area and travels through scenic Cecil County, Maryland. There are three distances to be traveled on the ride - 15 miles, 50K (31 miles), or 100K (62 miles). All routes have multiple well-manned rest stops that provide drinks, snacks, and restrooms. Upon completion of the ride, cyclists are rewarded with Kilby Cream Ice Cream and homemade goodies. Cycle for Cecil benefits the Cecil Land Trust, which works to preserve the open space and farmland that makes Cecil County so unique. Registration is available through Active.com and on the day of the event, this year on April 26th, 2014. Everyone who did last year's event absolutely loved it, and now it's time to step up the attendance. Your participation not only supports a great ride, but helps fund the preservation of farmland, woodlands, natural habitat and historic rural communities in Cecil County. The efforts of the Cecil Land Trust may be what keeps Cecil County a rural landscape, the one that many recreational, touring, and competitive cyclists enjoy today. Ahhh.. Someone else makes the connection between land conservation and great cycling!!! BRAVO!! In New Jersey the Sourland Spectacular ride does the same thing of showcasing the wonderful riding in the Sourland Mountain area in Mercer, Somerset and Hunterdon Counties with funds going to the organization that helps preserve the land from reckless development. I would like to send you updated information for the 2015 Cycle for Cecil that will be held on April 25, 2015. Can I please send you a flyer?